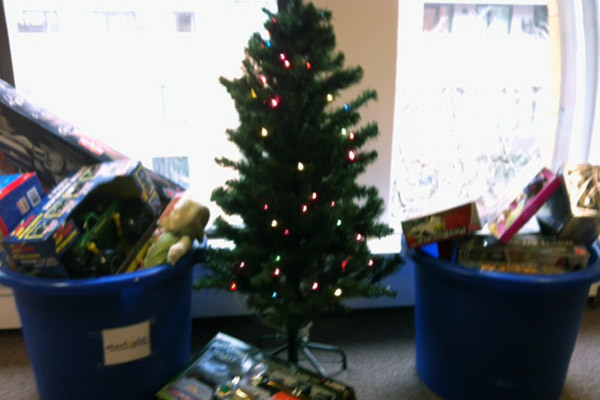 For the third consecutive year, March Communications organized a holiday toy drive to benefit the Starlight Children's Foundation of New England. Starlight New England is dedicated to bringing happiness, hope, and an improved quality of life to seriously ill children and their families in Maine, Massachusetts, New Hampshire, Rhode Island, and Vermont. Last year, March collected nearly 100 toys and delivered them to the children's ward at the Tufts New England Medical Center. This year, March distributed the toys to children on December 11 during the 31 Nights of Light celebration, held at The Shops at Prudential Center in Boston. At 5 pm, the Prudential Tower was lit purple to represent the Starlight Children's Foundation, and kids gathered in the mall lobby to sing Christmas carols. At 6 pm, gifts were distributed at the Microsoft Store and children enjoyed snacks provided by local vendors. March collected nearly 100 toys for 50 children, so each child received two toys. The drive ran until December 7.